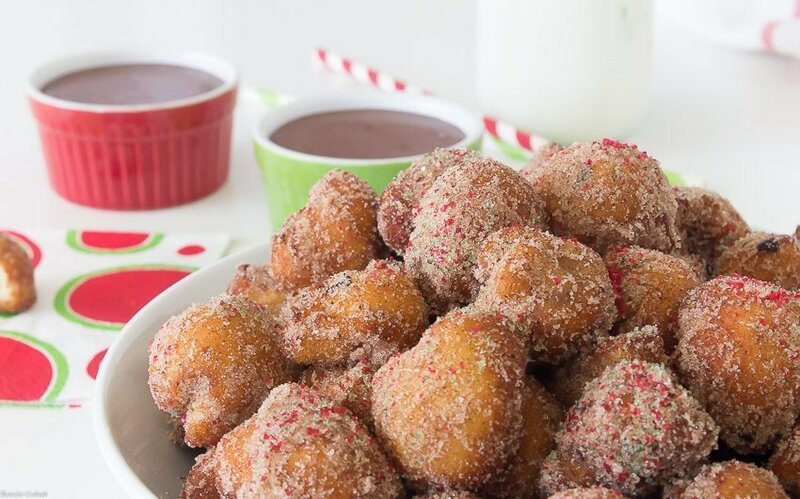 Whip up these Cinnamon Roll Churro Bites in no time for a fun, delicious treat. Sweet bites of cinnamon roll dough deep-fried, rolled in cinnamon and sugar, and served with a spicy chocolate dipping sauce. Guess what? The kiddo graduated from basic training yesterday! I am still trying to wrap my brain around the fact he is old enough to be out on his own. Now the fun part, waiting to see when will he get to come home for a visit… Starting Monday they have 10 days of in processing before we find out. 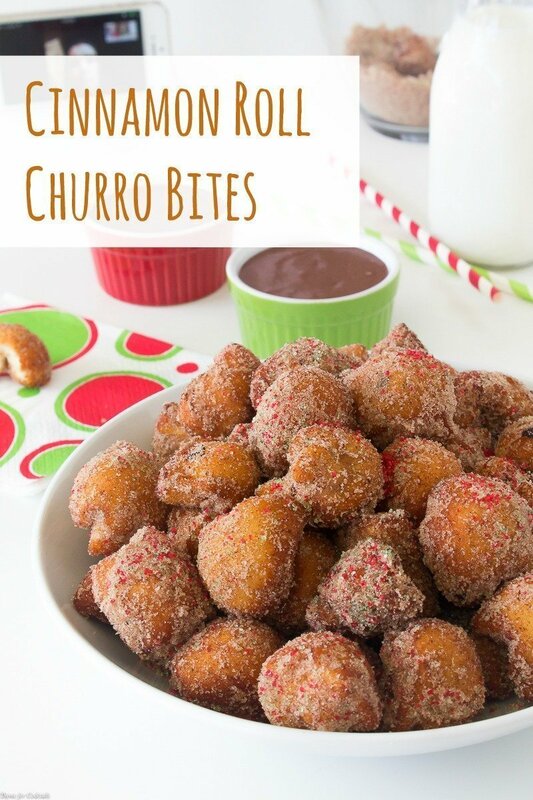 [bctt tweet=”Cinnamon Roll Churro Bites #dessert #holidays #baking” username=”thyme4cocktails”] It’s makes me a little sad it won’t be in time for his birthday, or even Christmas most likely, but the holidays are about time with family. Regardless when it OR how it is! 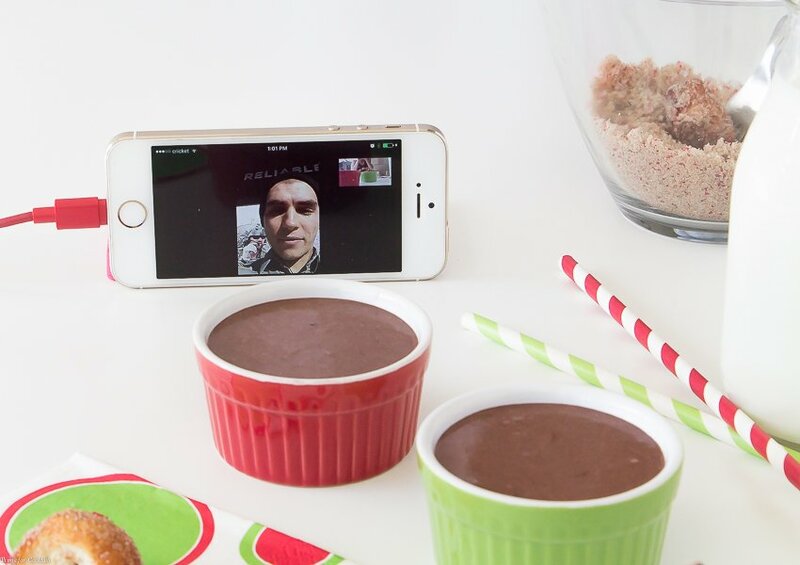 So this morning we spent a few hours video chatting back and forth while I made Cinnamon Roll Churro Bites. He says I am mean to tease him with snacks he can’t eat, but it was great to catch up on everything he experienced the last 14 weeks! It was almost like he was in the casa kitchen opening the cans of Pillsbury Grands Cinnamon Rolls from Walmart we use for this recipe. This post is sponsored by Pillsbury but all thoughts, ideas and creativity are mine folks. 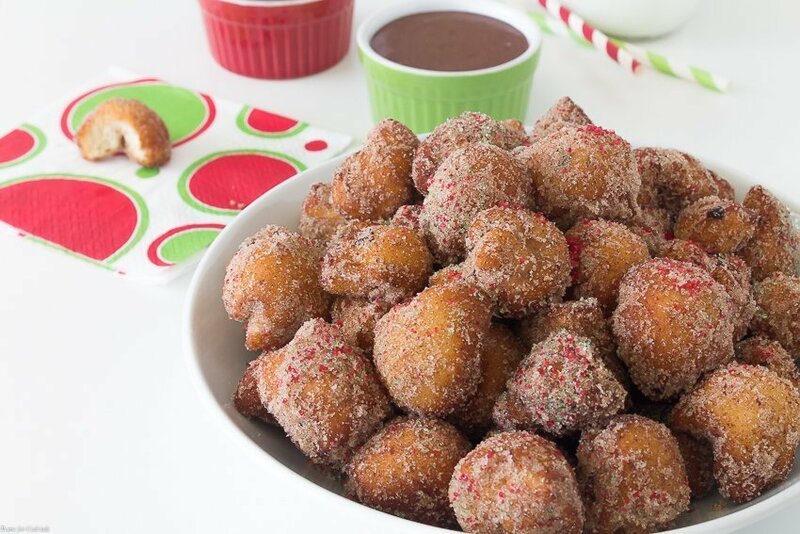 I created this recipe after a family camping trip to the snowy White Mountains of northern Arizona, where we love to deep fry canned biscuits over the campfire for quick, easy donuts. The guys asked for them at home one day, but the only thing in the casa fridge were a can of cinnamon rolls. I cut the dough into 1/2 inch pieces, rolled them into little balls and fried until golden brown. 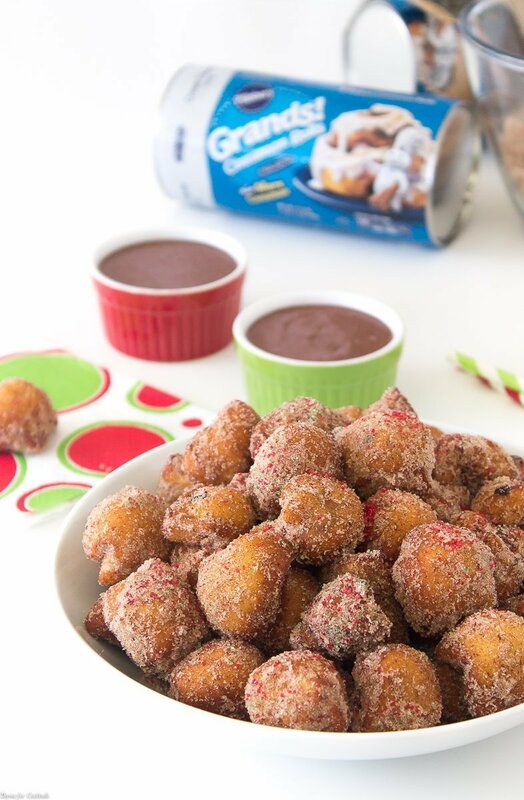 We didn’t want them plain, so the kiddo tossed them in cinnamon and sugar and Cinnamon Roll Churro Bites were born. I used the frosting to make a spicy chocolate dip and we were in sweet treat heaven! They are great for little hands too, the nieces and nephews loved making them at our last family gathering. 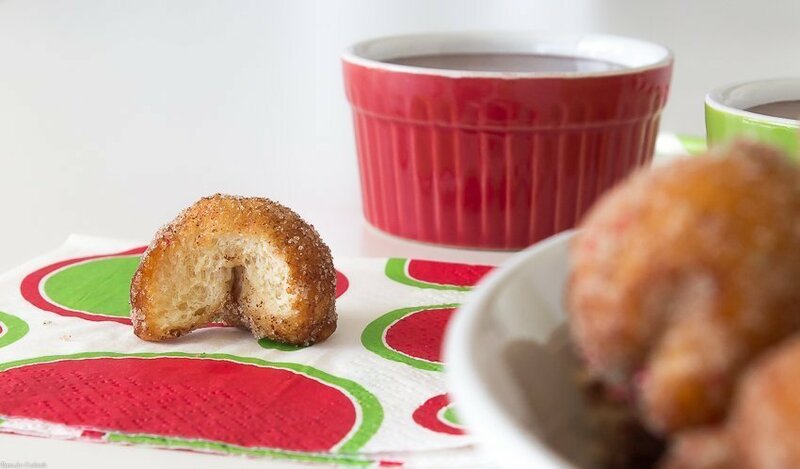 Whip up these Cinnamon Roll Churro Bites in no time for a fun, delicious treat. Sweet bites of cinnamon roll dough deep fried, rolled in cinnamon and sugar, and served with a spicy chocolate dipping sauce. Heat approximately 2 inches of oil to 350 degrees in a large Dutch oven. In a medium bowl mix together sugar, cinnamon and salt, set aside. Remove cinnamon rolls from can, set frosting aside. Separate and unroll dough on a cutting board. Cut dough into 1/2 inch pieces, roll each piece into a ball. Working batches deep fry dough balls, 1-2 minutes until golden brown. Let bites rest 1 minute on a paper towel lined plate. 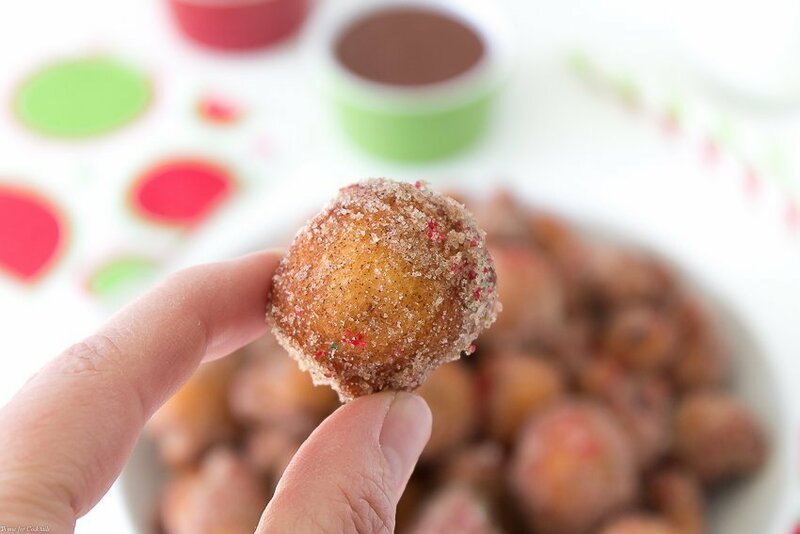 Toss in cinnamon and sugar while still hot. In a small bowl stir together frosting, cocoa powder and cayenne. Slowly add half and half to reach desired consistency. Serve bites warm with dipping sauce.